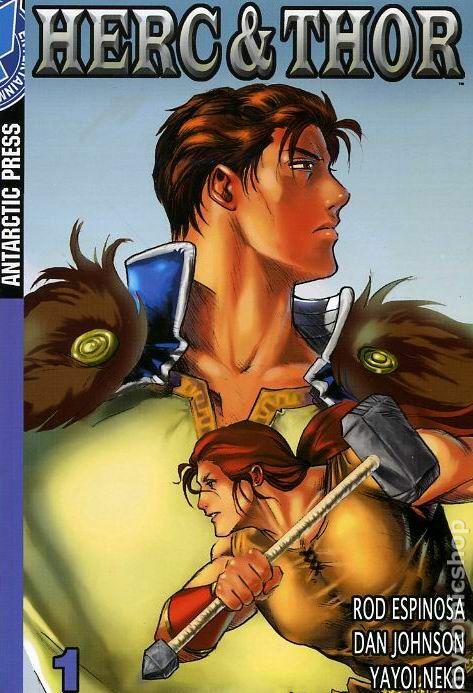 Published Nov 2006 by Antarctic Press. 1st printing. by Rod Espinosa and Dan JohnsonArt by Yayoi Neko. Thor, god of thunder, has lived a life of divine luxury. After a night with Aphrodite, though, he wakes up to find his mighty hammer missing! Now, new gods are threatening to take over Olympus, Asgard, and more! Exiled to Earth, Thor must enlist the aid of Hercules, whom he always belittled, to look for the hammer and stop the new gods before it's too late! Follow this "Godd Couple" as they strive to work together so they can survive an epic adventure of mythological proportions! Softcover, 5-in. x 7-in., B&W. Cover price $14.95.